This topic describes how to set up and manage a service gateway. A service gateway enables cloud resources without public IP addresses to privately access Oracle services. Hosts in your on-premises network: Use FastConnect public peering. Resources in your VCN: Use a service gateway. A service gateway lets your virtual cloud network (VCN) privately access specific Oracle services without exposing the data to the public internet. No internet gateway or NAT is required to reach those specific services. The resources in the VCN can be in a private subnet and use only private IP addresses. The traffic from the VCN to the Oracle service travels over the Oracle network fabric and never traverses the internet. The service gateway is regional and enables access only to supported Oracle services in the same region as the VCN. The service gateway allows access to supported Oracle services within the region to protect your data from the internet. Your workloads may require access to public endpoints or services not supported by the service gateway (for example, to download updates or patches). Ensure you have a NAT gateway or other access to the internet if necessary. The supported Oracle services are Oracle Cloud Infrastructure Object Storage and others in the Oracle Services Network. For a list, see Service Gateway: Supported Cloud Services in Oracle Services Network. The service gateway uses the concept of a service CIDR label, which is a string that represents all the regional public IP address ranges for the service or group of services of interest (for example, OCI PHX Object Storage is the string for Object Storage in us-phoenix-1). You use that service CIDR label when you configure the service gateway and related route rules to control traffic to the service. You can optionally use it when configuring security list rules. If the service's public IP addresses change in the future, you don't have to adjust those rules. A service gateway lets resources in your VCN privately access specific Oracle services, without exposing the data to an internet gateway or NAT. The resources in the VCN can be in a private subnet and use only private IP addresses. The traffic from the VCN to the service of interest travels over the Oracle network fabric and never traverses the internet. A subnet in which instances are not allowed to have public IP addresses. Resources in the private subnet have only private IP addresses. Internet gateway: To provide the public subnet direct access to public endpoints on the internet. Connections can be initiated from the subnet or from the internet. The resources in the public subnet must have public IP addresses. For more information, see Internet Gateway. Service gateway: To provide the private subnet with private access to supported Oracle services within the region. Connections can be initiated only from the subnet. NAT gateway: To provide the private subnet with private access to public endpoints on the internet. Connections can be initiated only from the subnet. For more information, see NAT Gateway. You control routing in your VCN at the subnet level, so you can specify which subnets in your VCN use each gateway. In the diagram, the route table for the public subnet sends non-local traffic through the internet gateway. 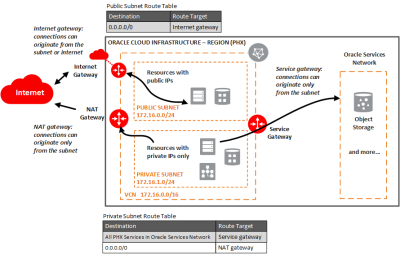 The route table for the private subnet sends traffic destined for the Oracle services through the service gateway. It sends all remaining traffic to the NAT gateway. See this known issue for information about configuring route rules with service gateway as the target on route tables associated with public subnets. A service gateway can be used only by resources in the gateway's own VCN. If the VCN is peered with another, resources in the other VCN cannot access the service gateway. Also, resources in an on-premises network connected to the service gateway's VCN with FastConnect or an IPSec VPN cannot use the service gateway. However, the on-premises network can use FastConnect public peering for private access to public Oracle Cloud Infrastructure services. For a list of services available with FastConnect public peering, see FastConnect Supported Cloud Services. A VCN can have only one service gateway. For more information about limits, see Service Limits. For instructions on setting up a service gateway, see Setting Up a Service Gateway in the Console. Each Oracle service has a regional public endpoint that uses public IP addresses for access. When you set up a service gateway with access to an Oracle service, you also set up Networking service route rules and optionally security list rules that control traffic with the service. That means you need to know the service's public IP addresses to set up those rules. To make it easier for you, the Networking service uses service CIDR labels to represent all the public CIDRs for a given Oracle service or a group of Oracle services. If a service's CIDRs change in the future, you don't have to adjust your route rules or security list rules. OCI PHX Object Storage is a service CIDR label that represents all the Object Storage CIDRs in the us-phoenix-1 region. All PHX Services in Oracle Services Network is a service CIDR label that represents all the CIDRs for the supported services in the Oracle Services Network in the us-phoenix-1 region. For a list of the services, see Service Gateway: Supported Cloud Services in Oracle Services Network. As you can see, a service CIDR label can be associated with either a single Oracle service (example: Object Storage), or multiple Oracle services. The term service is often used in this topic in place of the more accurate term service CIDR label. The important thing to remember is that when you set up a service gateway (and related route rules), you specify the service CIDR label you're interested in. In the Console, you're presented with the available service CIDR labels. If you use the REST API, the ListServices operation returns the available Service objects. The Service object's cidrBlock attribute contains the service CIDR label (example: all-phx-services-in-oracle-services-network). All <region> Services in Oracle Services Network: For a list of supported services, see Service Gateway: Supported Cloud Services in Oracle Services Network. See this known issue for information about accessing Oracle YUM services through the service gateway. To give your VCN access to a given service CIDR label, you must enable that service CIDR label for the VCN's service gateway. You can do that when you create the service gateway, or later after it's created. You can also disable a service CIDR label for the service gateway at any time. 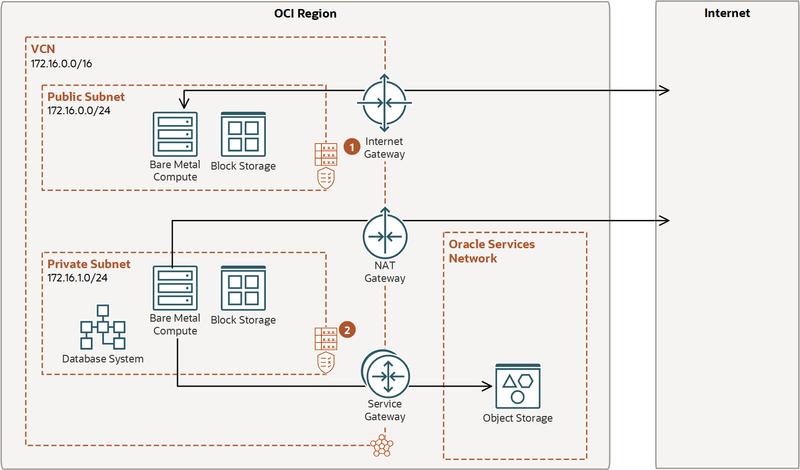 Because Object Storage is covered by both OCI <region> Object Storage and All <region> Services in Oracle Services Network, a service gateway can use only one of those service CIDR labels. Likewise, a route table can have a single rule for one of the service CIDR labels. It cannot have two separate rules, one for each label. Also, the Console enforces a special restriction: when you set up a route rule that uses a service gateway as the target, the rule's destination service must be the service CIDR label that is enabled for that service gateway. If you want to switch the service gateway to use a different service CIDR label, see To switch to a different service CIDR label. You create a service gateway in the context of a specific VCN. In other words, the service gateway is always attached to that one VCN. However, you can block or allow traffic through the service gateway at any time. By default, the gateway allows traffic flow upon creation. Blocking the service gateway traffic prevents all traffic from flowing, regardless of what service CIDR labels are enabled, or any existing route rules or security lists in your VCN. For instructions on how to block traffic, see To block or allow traffic for a service gateway. For traffic to be routed from a subnet in your VCN to a service gateway, you must add a rule accordingly to the subnet's route table. The rule must use the service gateway as the target. For the destination, you must use the service CIDR label that is enabled for the service gateway. This means that you don't have to know the specific public CIDRs, which could change over time. Any traffic leaving the subnet and destined for the service's public CIDRs is then routed to the service gateway. If the service gateway traffic is blocked, no traffic flows through it even if there's a route rule that matches the traffic. For instructions on setting up route rules for a service gateway, see Task 2: Update routing for the subnet. The subnet's security lists must also allow the desired traffic. If you like, you can use a service CIDR label instead of a CIDR for the source or destination of the desired traffic. Again, this means that you don't have to know the specific public CIDRs for the service. For convenience, you can use a service CIDR label in security list rules even if your VCN doesn't have a service gateway, and the traffic to the services uses an internet gateway. For stateful rules: Create an egress rule with the destination service = the service CIDR label of interest. As with any security list rule, you can specify other items such as the IP protocol and source and destination ports. For stateless rules: You must have both egress and ingress rules. Create an egress rule with the destination service = the service CIDR label of interest. Also create an ingress rule with the source service = the service CIDR label of interest. As with any security list rule, you can specify other items such as the IP protocol and source and destination ports. For instructions on setting up security list rules that use a service CIDR label, see Task 3: (Optional) Update the security lists for the subnet. The request goes through a service gateway. The request originates from the particular VCN or CIDR (for example, a subnet within a VCN) that is specified in the policy. For examples of this particular type of IAM policy, and important caveats about its use, see Task 4: (Optional) Update IAM Policies to Restrict Object Storage Bucket Access. To delete a service gateway, its traffic does not have to be blocked, but there must not be a route table that lists it as a target. See To delete a service gateway. For administrators: see IAM Policies for Networking. Following is the process for setting up a service gateway. It assumes that you already have a VCN with a subnet (either private or public). The service gateway allows access to supported Oracle services within the region to protect your data from the internet. Your applications may require access to public endpoints or services not supported by the service gateway (for example, to download updates or patches). Ensure you have a NAT gateway or other access to the internet if necessary. In the Console, confirm you're viewing the compartment that contains the VCN that you want to add the service gateway to. For information about compartments and access control, see Access Control. Open the navigation menu. Under Core Infrastructure, go to Networking and click Virtual Cloud Networks. Click the VCN you're interested in. On the left side of the page, click Service Gateways. Name: A descriptive name for the service gateway. It doesn't have to be unique. Avoid entering confidential information. Create in compartment: The compartment where you want to create the service gateway, if different from the compartment you're currently working in. Services: Optionally select the service CIDR label you're interested in. If you don't select one now, you can later update the service gateway and add a service CIDR label then. Without at least one service CIDR label enabled for the gateway, no traffic flows through it. Tags: Optionally, you can apply tags. If you have permissions to create a resource, you also have permissions to apply free-form tags to that resource. To apply a defined tag, you must have permissions to use the tag namespace. For more information about tagging, see Resource Tags. If you are not sure if you should apply tags, skip this option (you can apply tags later) or ask your administrator. The service gateway is then created and displayed on the Service Gateways page in the compartment you chose. The gateway allows traffic through it by default. At any time, you can block or allow the traffic through it. When you configure a service gateway for a particular service CIDR label, you must also create a route rule that specifies that label as the destination and the target as the service gateway. You do this for each subnet that needs to access the gateway. Determine which subnets in your VCN need access to the service gateway. Under Resources, click Route Tables. Click the route table you're interested in. Destination Service: The service CIDR label that is enabled for the gateway. Compartment: The compartment where the service gateway is located. Any subnet traffic with a destination that matches the rule is routed to the service gateway. For more information about setting up route rules, see Route Tables. Later, if you no longer need the service gateway and want to delete it, you must first delete all the route rules in your VCN that specify the service gateway as the target. Without the required routing, traffic doesn't flow over the service gateway. If a situation occurs where you want to temporarily stop the traffic flow over the gateway to a particular service, you can simply remove the route rule that enables traffic. You can also disable that particular service CIDR label for the gateway. Or you can block all traffic through the service gateway entirely. You do not have to delete the gateway. When you configure a service gateway to access a service CIDR label, you must also ensure that the security lists are configured to allow the desired traffic. Your security lists might already allow this traffic, which is why this task is optional. The following procedure describes how to set up a rule that uses the service CIDR label. You do this for each subnet that needs to access the gateway. Determine which subnets in your VCN need to connect to the services you're interested in. In the Console, while viewing the VCN you're interested in, click Security Lists. Click the security list you're interested in. Click Edit All Rules and create one or more rules, each for the specific type of traffic you want to allow. See the following example for more details. In the Allow Rules for Egress section, click +Add Rule. Leave the Stateless check box unselected. Destination Service: The service CIDR label that you're interested in. To access both Object Storage and Oracle YUM repos, it's All <region> Services in Oracle Services Network. IP Protocol: Leave as TCP. Source Port Range: Leave as All. Destination Port Range: Enter 443. Click Save Security List Rules at the bottom of the dialog box. For more information about setting up security list rules, see Security Lists. This task is applicable only if you're using a service gateway to access Object Storage. You can optionally write an IAM policy to allow only the resources in a specific VCN to write objects to a particular bucket. If you use one of the following IAM policies to restrict access to a bucket, the bucket is not accessible from the Console. It's accessible only from within the specific VCN or CIDR block. Also, the IAM policies allow requests to Object Storage only if they go from the specified VCN or CIDR block through the service gateway. If they go through the internet gateway, the requests are denied. The following example lets resources in the example ObjectBackup group write objects to an existing bucket called db-backup that resides in a compartment called ABC. Instead of specifying a VCN's OCID, you could specify a CIDR block. For example, the next version of the policy includes a request.ipv4.ipaddress variable with a value of 10.0.1.0/24. If the resource making the request has an IP address that is not in this CIDR block, the request is denied. See the instructions in Task 1: Create the service gateway. Update the service gateway: Remove the existing service CIDR label, and then add the one you want to switch to. You can't enable both labels for the service gateway. Update relevant route rules: For each rule that uses the service gateway as the target, switch the rule's destination service from the existing service CIDR label to the one you want to switch to. Update relevant security list rules: Change any security list rules that specify the existing service CIDR label to instead use the one you want to switch to. If you instead delete your existing service gateway and create a new one, your Object Storage connections will be disrupted. Remember that before you can delete a service gateway, you must delete any route rules that specify that gateway as a target. For the service gateway you're interested in, click the Actions icon (three dots), and then click Edit. For the service gateway you're interested in, click the Actions icon (three dots), and then click Block Traffic (or Allow Traffic if you're enabling traffic for the service gateway). When the traffic is blocked, the service gateway's icon turns gray, and the label changes to BLOCKED. When the traffic is allowed, the service gateway's icon turns green, and the label changes to AVAILABLE. Prerequisite: The service gateway does not have to block traffic, but there must not be a route table that lists it as a target. For the service gateway you're interested in, click the Actions icon (three dots), and then click Delete. For the service gateway you're interested in, click the Actions icon (three dots), and then click View Tags. From there you can view the existing tags, edit them, and apply new ones. For more information, see Resource Tags. If anyone in your organization implements a service gateway, be aware that you may need to update any client code that works with Networking service route rules and security lists. There are possible breaking API changes. For more information, see the service gateway release notes. ListServices: Use this to determine the available service CIDR labels. GetService: Gets the details for a particular service CIDR label. AttachServiceId: Enables a service CIDR label for a service gateway. DetachServiceId: Disables a service CIDR label for a service gateway. To manage route tables, see Route Tables. To manage security lists, see Security Lists. To manage IAM policies, see Managing Policies.